(Gray Dogwood (Cornus racemosa Lam.) - 01) The gray (sometimes spelled "grey") dogwood is a native shrub or bush with numerous stems that can typically be found in moist or rocky ground along streams, ponds, wet meadows, glade and thickets. 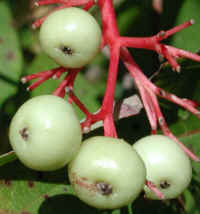 They are found in the Northeastern quarter of the United States and Southeastern Canada. Gray Dogwood usually don't grow much over 6 feet in height, and can be almost as broad, but some references say that they can grow to 10 or more feet in height. (Gray Dogwood (Cornus racemosa Lam.) 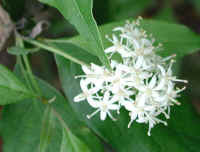 - 01a) The flowers of the gray dogwood grow in domed racemes that average about 2 inches across. The bark color can range from gray, particularly on the main stems and older branches to a reddish brown. The pointed elliptical or ovate leaves range in size from 2-1/2 to 5 inches long. 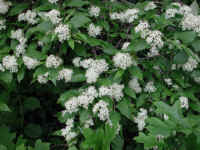 (Gray Dogwood (Cornus racemosa Lam.) - 02) One of the ways of identifying the gray dogwood are the four petals on each flower, that can be clearly seen even at this distance. 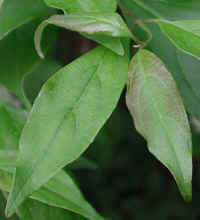 Another thing to look for are the wavy curled up edges (margins) of the leaves. (Gray Dogwood (Cornus racemosa Lam.) 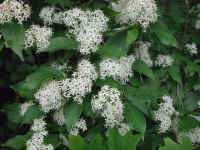 - 02a) In this closer look at the gray dogwood, we have a better look at the 4 petals on each flower, and the wavy curled margins of the leaves (don't be confused with the encroaching oak leaf at the bottom. Also note that the veining on the leaves arches around and becomes parallel to the margin or edge of the leaves. (Gray Dogwood (Cornus racemosa Lam.) 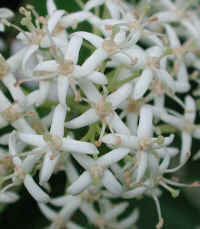 - 03) This is a closer look at one of the domed flowering racemes of the gray dogwood. Since the 1/4 inch flowers are crowded together, and overlap one another, it is sometime hard to distinguish each flower's components parts. (Gray Dogwood (Cornus racemosa Lam.) 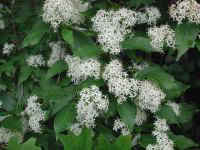 - 03a) Even in this bee's eye view of the flowering raceme of a gray dogwood, it is hard to identify all of the components of a flower, particularly since many of the stamens easily break off; however, each 1/4 inch flower has 4 petals, 4 stamens, and a central pistil. (Gray Dogwood (Cornus racemosa Lam.) 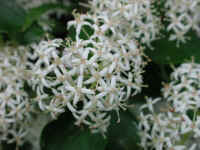 - 04) This is another close up look at a gray dogwood's flowering raceme. Note that in the upper left of the raceme that all of the stamens have fallen off the flowers, leaving only the 4 petals and solitary pistil. (Gray Dogwood (Cornus racemosa Lam.) - 05) In this photo we have a better look at the leaves of the gray dogwood, which grow opposite one another. (Gray Dogwood (Cornus racemosa Lam.) 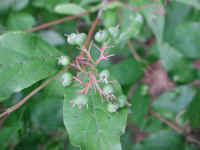 - 05a) In this photo we have a closer look at the end of a stem of the gray dogwood with its leaves. Note that between the two youngest leaves, there is a new sprout beginning. 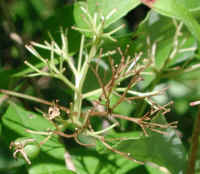 Also note that the leaves have a petiole (leaf stem) that attaches it to the stem of the bush. (Gray Dogwood (Cornus racemosa Lam.) - 05b) This is another look at a gray dogwood leaf. (Gray Dogwood (Cornus racemosa Lam.) 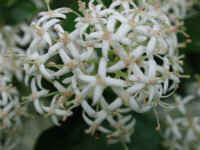 - 06) This is a look at one of the smaller domed racemes of the gray dogwood. (Gray Dogwood (Cornus racemosa Lam.) 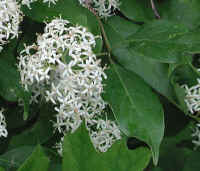 - 06a) In this closer look at a gray dogwood flowering raceme, it is somewhat easier to see that each flower has 4 stamens. 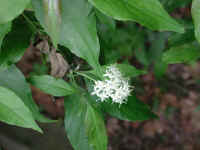 (Gray Dogwood (Cornus racemosa Lam.) 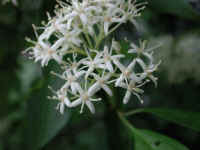 - 07) This is another close up look at a flowering raceme of a gray dogwood. (Gray Dogwood (Cornus racemosa Lam.) - 07a) In this bee's eye view of some of the gray dogwood flowers, we can clearly see the 4 stamens in the bottom left flower with its central pistil and 4 petals. (Gray Dogwood (Cornus racemosa Lam.) 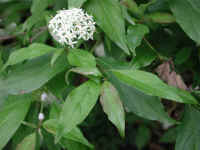 - 08) Gray dogwood seem to tolerate a wide range of soil conditions. 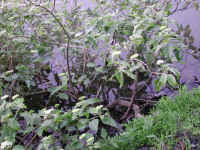 They grow along roadsides, which are fairly dry, and can be seen here, they grow in the water. 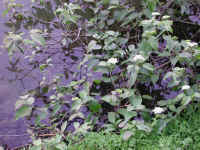 This particular gray dogwood has been growing up through the rip-rap at the water's edge for many years. (Gray Dogwood (Cornus racemosa Lam.) 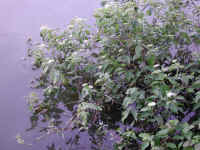 - 09) This is another look at the gray dogwood that is growing on the edge of the lake. (Gray Dogwood (Cornus racemosa Lam.) - 10) This is a another view of the gray dogwood with a few budding racemes. (Gray Dogwood (Cornus racemosa Lam.) - 10a) In this photo, we have a better view of the gray dogwood's newly budding racemes. (Gray Dogwood (Cornus racemosa Lam.) 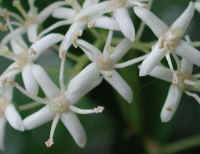 - 11) For some unknown reason, very few of the flowers produced any fruit. Most of the racemes are bare. (Gray Dogwood (Cornus racemosa Lam.) 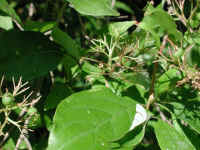 - 11a) In this close up look at a once flowering raceme, which had flowers at the ends of each stem, we now have only two unripe fruit growing. (Gray Dogwood (Cornus racemosa Lam.) 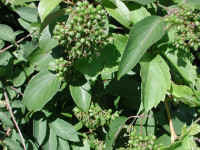 - 11b) This gray dogwood raceme has only one piece of fruit remaining to ripen. (Gray Dogwood (Cornus racemosa Lam.) - 12) In this photo of three other gray dogwood racemes, we can see that one raceme is completely bare, another has only one unripe fruit, and the third has only a few. (Gray Dogwood (Cornus racemosa Lam.) 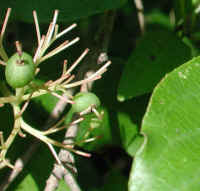 - 12a) Only four pieces of gray dogwood fruit remain to ripen on these three racemes, and one of the fruit seems to be deformed (right side of photo). (Gray Dogwood (Cornus racemosa Lam.) 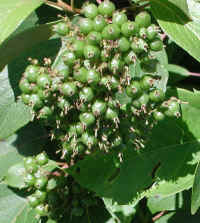 - 13) This gray dogwood raceme has 11 pieces of fruit remaining to ripen. We don't know what this plant had such sparsely developed fruit. (Gray Dogwood (Cornus racemosa Lam.) 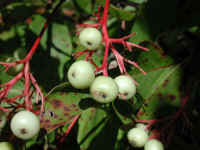 - 13a) This is a closer look at some of the fruit on the gray dogwood. One of the fruit seems to have had someone take a bite out of it. (Gray Dogwood (Cornus racemosa Lam.) - 14) This is another look at the sparse fruit on the gray dogwood. (Gray Dogwood (Cornus racemosa Lam.) 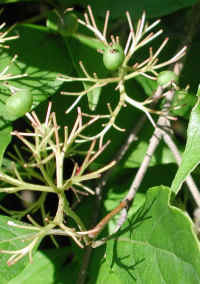 - 15) This photo of a gray dogwood shows a more normal development of fruit. (Gray Dogwood (Cornus racemosa Lam.) 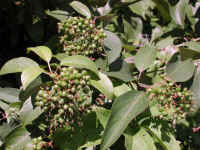 - 15a) This is a closer look at the fruit clusters on this gray dogwood. (Gray Dogwood (Cornus racemosa Lam.) 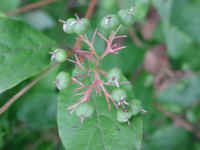 - 16) This is another look at the fruit on this gray dogwood. (Gray Dogwood (Cornus racemosa Lam.) 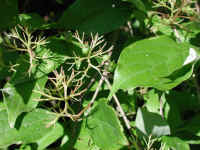 - 16a) Even on this gray dogwood with its normal development of fruit, we saw this raceme with many underdeveloped fruit, and some that look like they will never develop. (Gray Dogwood (Cornus racemosa Lam.) 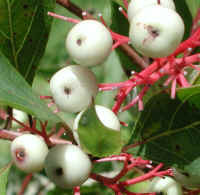 - 17) The fruit of the gray dogwood ripen into these white berries. (Gray Dogwood (Cornus racemosa Lam.) 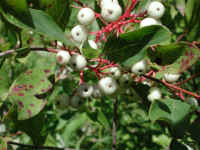 - 17a) This is a closer look at some of the white fruit of the gray dogwood. (Gray Dogwood (Cornus racemosa Lam.) - 18) This is another look at the white fruit of the gray dogwood. 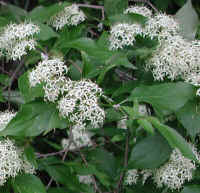 (Gray Dogwood (Cornus racemosa Lam.) 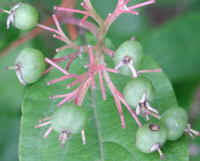 - 18a) This is another close up look at the 1/4 inch diameter fruit of the gray dogwood.